Here's some lovely economical tasty treats for you to try. Have a go and let us know what you think. Put the dried fruit to soak in a small bowl with the zest and juice of a Clementine Satsuma etc. Measure 100g of the flour in a bowl with the dried yeast, the sugar and the milk. Whisk well until all the yeast has dissolved and leave to sponge in a warm place for approximately 20 minutes. Now place the rest of the flour in a large bowl with the butter-type- margarine, the salt and spice. Whisk the golden syrup into the milk/yeast liquid with the dried fruit mixture and add this to the flour to make a soft dough. Work well either in a mixer or by hand for at least ten minutes. Cover with some oiled clear-wrap or a cloth and leave to stand in a warm place until the dough has doubled in size approximately 1½ - 2 hours . Form into tea-cakes by dividing into rounds and flattening slightly. Place on tins covered with cloths. Leave to rise. After 45 minutes or until really puffy, brush with milk and place in the oven. Bake for 20 minutes approximately or until they are golden brown and give a hollow beat when tapped. After baking and tasting we wondered why we’d never made these bad boys before! Soo much better than shop and soo cheap!!!!!! This kind, loving cheapy soup is a hug in a mug. It takes the simplest of ingredients and can be made in minutes. It will sit in flask at work or wait in the fridge to welcome you home from a rainy day. Enjoy our favourite family soup. 1 400gm pack basic frozen peas. Peel and chop the onions. Add to a large saucepan with the oil and sweat gently for approximately ten minutes to soften. Scrub the potatoes and chop into chunks leaving on the skins. Cover with 2 litres vegetable stock made with either two veggie stock cubes or 6 teaspoon marigold powder. Simmer gently and when almost tender add half the packet of peas. Add the other half to a processor leaving approximately 50g peas to add a little texture if desired. Process until smooth. Now add the remaining soup contents and process. Add the few uncooked peas. Serve hot with warm crusty bread. Add two finely chopped leeks and a little more stock to the mix plus a good bunch of parsley. Cut up the potatoes, place in a glass dish and half cover with water. Cook for 20 minutes on high in the microwave. Strain off the water but save it. Mash the potatoes with some of the water seasoning well and when a good consistency is achieved, place half of the seasoned mash in an oven-to-table pottery dish. Cover with half the cheese and vegetables if required. 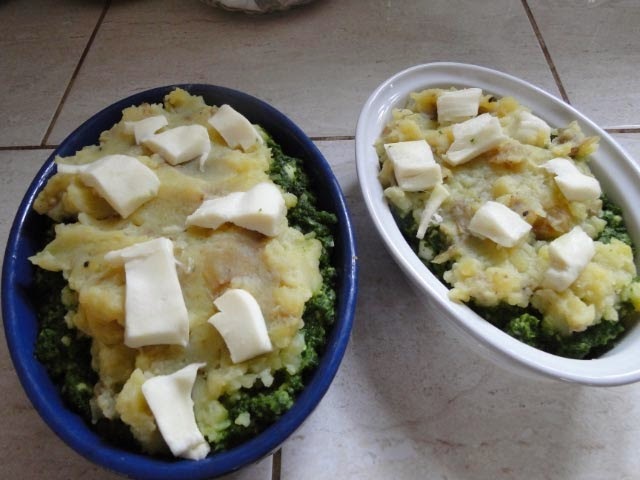 Add the remaining potatoes and cover with more cheese. Bake in the oven for 30 minutes 180C, gas mark 4 for 30minutes. Serve when golden and bubbling and enjoy. 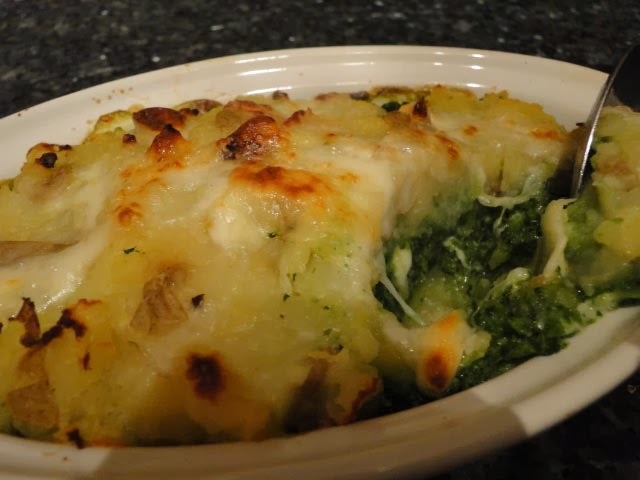 Variation as in picture – place 200g per person of almost cooked vegetables such as broccoli, frozen peas, corn, cooked leeks or spinach, on the base of the dish. 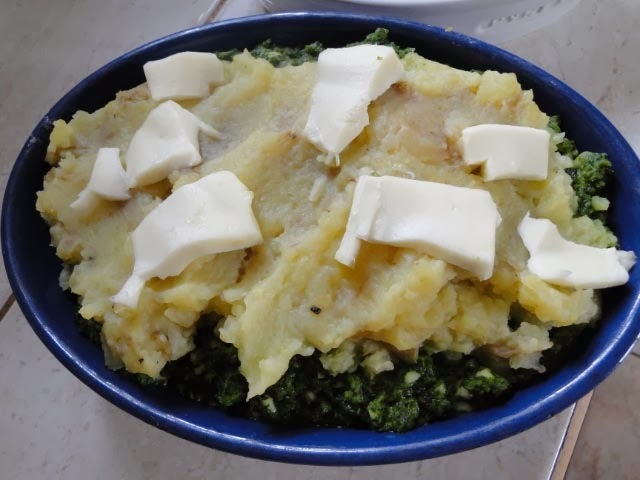 Cover with the mashed potato and cheese. If the vegetables are cooked and frozen they can be left in their frozen state and will defrost while cooking.